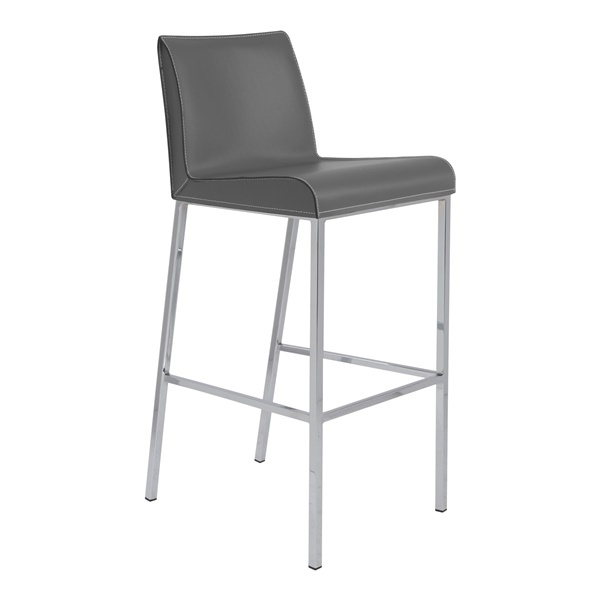 Classic sensibilities give the Cam Bar Stool a refined elegance, while fluid, contemporary lines give it an air of fresh sophistication. The Cam’s simple design fits well into any bar space and with any bar table. The Cam’s slender block legs are crafted from 1.5 mm chromed steel for a durable and sturdy stance, and feature a welded chromed footrest for added support. The seat and back are wrapped in quality regenerated leather upholstery for the perfect touch of luxury, while foam padding adds supreme comfort. Piping along the seat edges gives each stool a subtle touch of distinction. Available in your choice of colors.